Interested in learning more about what we can add to your wedding? Studio Whimzy wants to add a splash of creativity to your wedding season. We have so many options that will bring entertainment and lasting memories to your wedding festivities. The studio can help gift your wedding party with personalized paintings, notecards or prints. 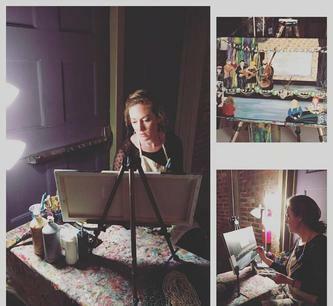 Or, invite your guest to be our guest for an afternoon/evening event where each can create a masterpiece to keep forever that is inspired by the specifics of your wedding. 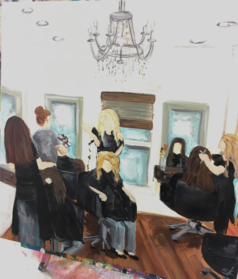 It is always fun to gather the ladies for a "Ladies Night Out" at Studio Whimzy. 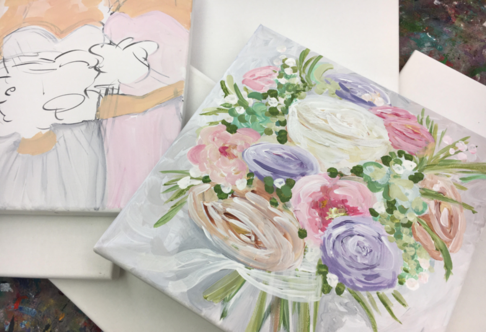 Invite Studio Whimzy's owner, Sarah Kathryn Dossett, to create a LIVE painting during your wedding or reception and if you would prefer a canvas creation of your wedding day bouquet she can create a keepsake just for you. You can view photos and a list of options below.